With the rising awareness of climate change impacts by both national and international bodies, building climate resilience has become a major goal for these institutions. The key focus of climate resilience efforts is to address the vulnerability that communities, states, and countries currently have with regards to the environmental consequences of climate change. Currently, climate resilience efforts encompass social, economic, technological, and political strategies that are being implemented at all scales of society. From local community action to global treaties, addressing climate resilience is becoming a priority, although it could be argued that a significant amount of the theory has yet to be translated into practice. Despite this, there is a robust and ever-growing movement fueled by local and national bodies alike geared towards building and improving climate resilience. The fact that climate resilience encompasses a dual function, to absorb shock as well as to self-renew, is the primary means by which it can be differentiated from the concept of climate adaptation. In general, adaptation is viewed as a group of processes and actions that help a system absorb changes that have already occurred, or may be predicted to occur in the future. For the specific case of environmental change and climate adaptation, it is argued by many that adaptation should be defined strictly as encompassing only active decision-making processes and actions - in other words, deliberate changes made in response to climate change. Of course, this characterization is highly debatable: after all, adaptation can also be used to describe natural, involuntary processes by which organisms, populations, ecosystems and perhaps even social-ecological systems evolve after the application of certain external stresses. However, for the purposes of differentiating climate adaptation and climate resilience from a policymaking standpoint, we can contrast the active, actor-centric notion of adaptation with resilience, which would be a more systems-based approach to building social-ecological networks that are inherently capable of not only absorbing change, but utilizing those changes to develop into more efficient configurations. A graphic displaying the inter-connectivity between climate change, adaptability, vulnerability, and resilience. A conversation about climate resilience is incomplete without also incorporating the concepts of adaptations, vulnerability, and climate change. If the definition of resiliency is the ability to recover from a negative event, in this case climate change, then talking about preparations beforehand and strategies for recovery (aka adaptations), as well as populations that are more less capable of developing and implementing a resiliency strategy (aka vulnerable populations) are essential. This is framed under the assumed detrimental impacts of climate change to ecosystems and ecosystem services. Climate resilience is a relatively novel concept that is still in the process of being established by academia and policymaking institutions. However, the theoretical basis for many of the ideas central to climate resilience have actually existed since the 1960s. Originally an idea defined for strictly ecological systems, resilience was initially outlined by C.S. Holling as the capacity for ecological systems and relationships within those systems to persist and absorb changes to “state variables, driving variables, and parameters.”  This definition helped form the foundation for the notion of ecological equilibrium: the idea that the behavior of natural ecosystems is dictated by a homeostatic drive towards some stable set point. Under this school of thought (which maintained quite a dominant status during this time period), ecosystems were perceived to respond to disturbances largely through negative feedback systems – if there is a change, the ecosystem would act to mitigate that change as much as possible and attempt to return to its prior state. However, the idea of resilience began evolving relatively quickly in the coming years. Eventually by the late 1980s and early 1990s, resilience had fundamentally changed as a theoretical framework. Not only was it now applicable to social-ecological systems, but more importantly, resilience now incorporated and emphasized ideas of management, integration, and utilization of change rather than simply describing reactions to change. Resilience was no longer just about absorbing shocks, but also about harnessing the changes triggered by external stresses to catalyze the evolution the social-ecological system in question. As the issues of global warming and climate change have gained traction and become more prominent since the early 1990s, the question of climate resilience has also emerged. Considering the global implications of the impacts induced by climate change, climate resilience has become a critical concept that scientific institutions, policymakers, governments, and international organizations have begun to rally around as a framework for designing the solutions that will be needed to address the effects of global warming. Vulnerability is an essential component of the climate resilience discussion because people that are the most likely to experience the majority of negative impacts of climate change are those that are least capable of developing robust and comprehensive climate resiliency infrastructure and response systems. However what exactly constitutes a vulnerable community is still open to debate. The International Panel on Climate Change has defined vulnerability using three characteristics: the “adaptive capacity, sensitivity, and exposure” to the effects of climate change. The adaptive capacity refers to a community’s capacity to create resiliency infrastructure, while the sensitivity and exposure elements are both tied to economic and geographic elements that vary widely in differing communities. There are, however, many commonalities between vulnerable communities. Vulnerability can mainly be broken down into 2 major categories, economic vulnerability, based on socioeconomic factors, and geographic vulnerability. Neither are mutually exclusive. World gross national income per capita. At its basic level, a community that is economically vulnerable is one that is ill prepared for the effects of climate change because it lacks the needed financial resources. Preparing a climate resilient society will require huge investments in infrastructure, city planning, engineering sustainable energy sources, and preparedness systems. From a global perspective, it is more likely that people living at or below poverty will be affected the most by climate change and are thus the most vulnerable, because they will have the least amount of resource dollars to invest in resiliency infrastructure. They will also have the least amount of resource dollars for cleanup efforts after more frequently occurring natural climate change related disasters. A second definition of vulnerability relates to geographic vulnerability. The most geographically vulnerable locations to climate change are those that will be impacted by side effects of natural hazards, such as rising sea levels and by dramatic changes in ecosystem services, including access to food. Island nations are usually noted as more vulnerable but communities that rely heavily on a sustenance based lifestyle are also at greater risk. 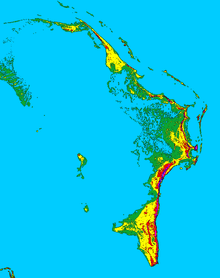 Abaco Islands- An example of a low elevation island community likely to be impacted by rising sea level associated with changing climate. Roger E. Kasperson and Jeanne X. Kasperson of the Stockholm Environmental Institute compiled a list of vulnerable communities as having one or more of these characteristics. Equity is another essential component of vulnerability and is closely tied to issues of environmental justice and climate justice. Who participates in and who has access to climate resiliency services and infrastructure are more than likely going to fall along historically unequitable patterns of distribution. As the most vulnerable communities are likely to be the most heavily impacted, a climate justice movement is coalescing in response. There are many aspects of climate justice that relate to resiliency and many climate justice advocates argue that justice should be an essential component of resiliency strategies. Similar frameworks that have been applied to the Climate Justice movement can be utilized to address some of these equity issues. The frameworks are similar to other types of justice movements and include- contractariansim which attempts to allocate the most benefits for the poor, utilitarianism which seeks to find the most benefits for the most amount of people, egalitarianism which attempts to reduce inequality, and libertarianism which emphasizes a fair share of burden but also individual freedoms. The Act for Climate Justice Campaign has defined climate justice as “a vision to dissolve and alleviate the unequal burdens created by climate change. As a form of environmental justice, climate justice is the fair treatment of all people and freedom from discrimination with the creation of policies and projects that address climate change and the systems that create climate change and perpetuate discrimination”. Climate Justice can incorporate both grassroots as well as international and national level organizing movements. Many indigenous peoples live sustenance based lifestyles, relying heavily on local ecosystem services for their livelihoods. According to some definitions, indigenous peoples are often some of the most vulnerable to the impacts of climate change and advocating for participation of marginalized groups is one goal of the indigenous people’s climate justice movement. Climate change will likely dramatically alter local food production capacity, which will impact those people who are more dependent on local food sources and less dependent on global or regional food supplies. The greatest injustice is that people living this type of lifestyle are least likely to have contributed to the causes of global climate change in the first place. Indigenous peoples movements often involve protests and calling on action from world leaders to address climate change concerns. Another local level climate justice movement is the adaptation finance approach which has been found in some studies to be a positive solution by providing resource dollars directly to communities in need. The carbon market approach is one international and national concept proposed that tries to solve the issue by using market forces to make carbon use less affordable, but vulnerable host communities that are the intended beneficiaries have been found to receive little to no benefit. One problem noted with the carbon market approach is the inherent conflict of interest embedded between developed and sustenance based communities. Developed nations that have often prioritized growth of their own gross national product over implementing changes that would address climate change concerns by taxing carbon which might damage GDP. In addition the pace of change necessary to implement a carbon market approach is too slow to be effective at most international and national policy levels. The issue of environmental justice and climate justice is relevant within the United States because historically communities of color and low socioeconomic communities have been under served and underrepresented in terms of distribution and participation. The question of “by and for whom” resiliency strategies are targeted and implemented is of great concern. Inadequate response and resiliency strategies to recent natural disasters in communities of color, such as Hurricane Katrina, are examples of environmental injustices and inadequate resilience strategies in already vulnerable communities. New Orleans post Hurricane Katrina levee damage. The National Association for the Advancement of Colored PeopleNAACP has recently begun a Climate Justice campaign in response to events such as Hurricane Katrina and in preparation for future climate change related natural disasters. The goal of this campaign is to address the 3 R’s of climate justice: resilience, resistance, and revisioning. The NAACP’s climate justice initiative will address climate resilience through advocacy, outreach, political actions, research and education. Another concept important for understanding vulnerability in the United States is the climate gap. The climate gap is the inequitably negative impact on poor people and people of color due to the effects of climate change. Some of these negative impacts include higher cost of living expenses, higher incidences of heat related health consequences in urban areas that are likely to experience urban heat island effects, increased pollution in urban areas, and decreases in available jobs for poor people and people of color. Some suggested solutions to close the climate gap include suggesting legislative policies that would reduce the impact of climate change by reducing carbon emissions with the emphasis of reductions in greenhouse gas emissions and toxic air pollution in neighborhoods that are already heavily impacted, usually urban centers. Other solutions include increasing access to quality health care for poor people and people of color, preparedness planning for urban heat island effects, identifying neighborhoods that are most likely to be impacted, investing in alternative fuel and energy research, and measuring the results of policy impacts. As the threat of environmental disturbances due to climate change becomes more and more relevant, so does the need for strategies to build a more resilient society. As climate resiliency literature has revealed, there are different strategies and suggestions that all work towards the overarching goal of building and maintaining societal resiliency. There is increasing concern on an international level with regards to addressing and combating the impending implications of climate change for urban areas, where populations of these cities around the world are growing disproportionately high. There is even more concern for the rapidly growing urban centers in developing countries, where the majority of urban inhabitants are poor or “otherwise vulnerable to climate-related disturbances.” Urban centers around the world house important societal and economic sectors, so resiliency framework has been augmented to specifically include and focus on protecting these urban systems. 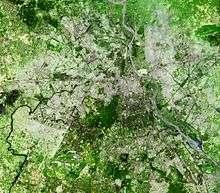 The Intergovernmental Panel on Climate Change (IPCC) defines resilience as “the ability of a social or ecological system to absorb disturbances while retaining the same basic structure and ways of functioning, the capacity of self-organization, and the capacity to adapt to stress and change.” One of the most important notions emphasized in urban resiliency theory is the need for urban systems to increase their capacity to absorb environmental disturbances. By focusing on three generalizable elements of the resiliency movement, Tyler and Moench’s urban resiliency framework serves as a model that can be implemented for local planning on an international scale. The first element of urban climate resiliency focuses on “systems’ or the physical infrastructure embedded in urban systems. A critical concern of urban resiliency is linked to the idea of maintaining support systems that in turn enable the networks of provisioning and exchange for populations in urban areas. These systems concern both physical infrastructure in the city and ecosystems within or surrounding the urban center; while working to provide essential services like food production, flood control, or runoff management. For example, city electricity, a necessity of urban life, depends on the performance of generators, grids, and distant reservoirs. The failure of these core systems jeopardizes human well-being in these urban areas, with that being said, it is crucial to maintain them in the face of impending environmental disturbances. Societies need to build resiliency into these systems in order to achieve such a feat. Resilient systems work to “ensure that functionality is retained and can be re-instated through system linkages” despite some failures or operational disturbances. Ensuring the functionality of these important systems is achieved through instilling and maintaining flexibility in the presence of a “safe failure.” Resilient systems achieve flexibility by making sure that key functions are distributed in a way that they would not all be affected by a given event at one time, what is often referred to as spatial diversity, and has multiple methods for meeting a given need, what is often referred to as functional diversity. The presence of safe failures also plays a critical role in maintaining these systems, which work by absorbing sudden shocks that may even exceed design thresholds. Environmental disturbances are certainly expected to challenge the dexterity of these systems, so the presence of safe failures almost certainly appears to be a necessity. Further, another important component of these systems is bounce-back ability. In the instance where dangerous climatic events affect these urban centers, recovering or "bouncing-back" is of great importance. In fact, in most disaster studies, urban resilience is often defined as "the capacity of a city to rebound from destruction." This idea of bounce-back for urban systems is also engrained in governmental literature of the same topic. For example, the former government's first Intelligence and Security Coordinator of the United States described urban resilience as "the capacity to absorb shocks and to bounce back into functioning shape, or at the least, sufficient resilience to prevent...system collapse." Keeping these quotations in mind, bounce-back discourse has been and should continue to be an important part of urban climate resiliency framework. Other theorists have critiqued this idea of bounce-back, citing this as privileging the status quo, rather advocating the notion of ‘bouncing forward’, permitting system evolution and improvement. The next element of urban climate resiliency focuses on the social agents (also described as social actors) present in urban centers. Many of these agents depend on the urban centers for their very existence, so they share a common interest of working towards protecting and maintaining their urban surroundings. Agents in urban centers have the capacity to deliberate and rationally make decisions, which plays an important role in climate resiliency theory. One cannot overlook the role of local governments and community organizations, which will be forced to make key decisions with regards to organizing and delivering key services and plans for combating the impending effects of climate change. Perhaps most importantly, these social agents must increase their capacities with regards to the notions of “resourcefulness and responsiveness. Responsiveness refers to the capacity of social actors and groups to organize and re-organize, as well as the ability to anticipate and plan for disruptive events. Resourcefulness refers to the capacity of social actors in urban centers to mobilize varying assets and resources in order to take action. Urban centers will be able to better fend for themselves in the heat of climatic disturbances when responsiveness and resourcefulness is collectively achieved in an effective manner. The final component of urban climate resiliency concerns the social and political institutions present in urban environments. Governance, the process of decision making, is a critical element affecting climate resiliency. As climate justice has revealed, the individual areas and countries that are least responsible for the phenomenon of climate change are also the ones who are going to be most negatively affected by future environmental disturbances. The same is true in urban centers. Those who are most responsible for climate change are going to disproportionately feel the negative effects of climatic disturbances when compared to their poorer, more vulnerable counterparts in society. Just like the wealthier countries have worked to create the most pollution, the wealthier subpopulations of society who can afford carbon-emitting luxuries like cars and homes undoubtedly produce a much more significant carbon footprint. It is also important to note that these more vulnerable populations, because of their inferior social statuses, are unable to participate in the decision-making processes with regards to these issues. Decision-making processes must be augmented to be more participatory and inclusive, allowing those individuals and groups most affected by environmental disturbances to play an active role in determining how to best avoid them. Another important role of these social and political institutions will concern the dissemination of public information. Individual communities who have access to timely information with regards to hazards are better able to respond to these threats. Global climate change is going to increase the probability of extreme weather events and environmental disturbances around the world, needless to say, future human populations are going to have to confront this issue. Every society around the world differs in its capacity with regards to combating climate change because of certain pre-existing factors such as having the proper monetary and institutional mechanisms in place to execute preparedness and recovery plans. Despite these differences, communities around the world are on a level-playing field with regards to building and maintaining at least some degree “human resilience”. Resilience has two components: that provided by nature, and that provided through human action and interaction. An example of climate resilience provided by nature is the manner in which porous soil more effectively allows for the drainage of flood water than more compact soil. An example of human action that affects climate resilience would be the facilitation of response and recovery procedures by social institutions or organizations. This theory of human resilience largely focuses on the human populations and calls for building towards the overall goal of decreasing human vulnerability in the face of climate change and extreme weather events. Vulnerability to climatic disturbances has two sides: the first deals with the degree of exposure to dangerous hazards, which one can effectively identify as susceptibility. The second side deals with the capacity to recover from disaster consequences, or resilience in other words. The looming threat of environmental disturbances and extreme weather events certainly calls for some action, and human resiliency theory seeks to solve the issue by largely focusing on decreasing the vulnerability of human populations. How do human populations work to decrease their vulnerability to impending and dangerous climatic events? Up until recently, the international approach to environmental emergencies focused largely on post-impact activities such as reconstruction and recovery. However, the international approach is changing to a more comprehensive risk assessment that includes “pre-impact disaster risk reduction - prevention, preparedness, and mitigation.” In the case of human resiliency, preparedness can largely be defined as the measures taken in advance to ensure an effective response to the impact of environmental hazards. Mitigation, when viewed in this context, refers to the structural and nonstructural measures undertaken to limit the adverse impacts of climatic disturbances. This is not to be confused to mitigation with regards to the overall topic of climate change, which refers to reduction of carbon or greenhouse emissions. By accounting for these impending climate disasters both before and after the occur, human populations are able to decrease their vulnerability to these disturbances. A major element of building and maintaining human resilience is public health. The institution of public health as a whole is uniquely placed at the community level to foster human resilience to climate-related disturbances. As an institution, public health can play an active part in reducing human vulnerability by promoting “healthy people and healthy homes.”) Healthy people are less likely to suffer from disaster-related mortality and are therefore viewed as more disaster-resilient. Healthy homes are designed and built to maintain its structure and withstand extreme climate events. By merely focusing on the individual health of populations and assuring the durability of the homes that house these populations, at least some degree human resiliency towards climate change can be achieved. Thus it can be seen that to build climate resilience one must work within a network of related social and economic decisions that can have adverse effects on the success of a resilience effort given the competing interests participating in the discussion. Given this, it is clear that the social and economic scale play a vital role in shaping the feasibility, costs, empirical success, and efficiency of climate resilience initiatives. There is a wide variety of actions that can be pursued to improve climate resilience at multiple scales – the following subsections we will review a series of illustrative case studies and strategies from a broad diversity of societal contexts that are currently being implemented to strengthen climate resilience. Modern climate resilience scholars have noted that contrary to conventional beliefs, the communities that have been most effective in establishing high levels of climate resilience have actually done so through “bottom-up” political pressures. “Top-down” approaches involving state or federal level decisions have empirically been marred with dysfunction across different levels of government due to internal mismanagement and political gridlock. As a result, in many ways it is being found that the most efficient responses to climate change have actually been initiated and mobilized at local levels. Particularly compelling has been the ability of bottom-up pressures from local civil society to fuel the creation of micropolitical institutions that have compartmentalized the tasks necessary for building climate resilience. For example, the city of Tokyo, Japan has developed a robust network of micropolitical agencies all dedicated to building resilience in specific industrial sectors: transportation, workplace conditions, emergency shelters, and more. Due to their compact size, local level micropolitical bodies can act quickly without much stagnation and resistance from larger special interests that can generate bureaucratic dysfunction at higher levels of government. Additionally, a key focus of action at state and federal levels is in improving water management infrastructure and access. Strategies include the creation of emergency drinking water supplies, stronger sanitation technology and standards, as well as more extensive and efficient networks of water delivery. Climate resilience literature has also noted that one of the more indirect sources of resilience actually lies in the strength of the social services and social safety net that is provided for citizens by public institutions. This is an especially critical aspect of climate resilience in more socioeconomically disadvantaged communities, cities, and nations. It has been empirically found that places with stronger systems of social security and pensions oftentimes have better climate resiliency. This is reasoning in the following manner: first of all, better social services for citizens translates to better access to healthcare, education, life insurance, and emergency services. Secondly, stronger systems of social services also generally increase the overall ownership of relevant economic assets that are correlated with better quality of life such as savings, house ownership, and more. Nations where residents are on more stable economic footing are in situations where there is a far higher incentive for private investment into climate resilience efforts. At the global level, most action towards climate resilience has been manifested in the signing of international agreements that set up guidelines and frameworks to address the impacts of climate change. Notable examples include the 1992 United Nations Framework Convention on Climate Change (UNFCCC), the 1997 Kyoto Protocol to the UNFCCC, and the 2010 Cancun Agreement. In some cases, as is the case with the Kyoto Protocol for example, these international treaties involve placing legally binding requirements on participant nations to reduce processes that contribute to global warming such as greenhouse gas emissions. In other cases, such as the 2010 United Nations Climate Change Conference in Cancun, proposals for the creation of international funding pools to assist developing nations in combating climate change are seen. However, that enforcement of any of the requirements or principles that are established in such international treaties has ambiguous: for example, although the 2010 Cancun conference called for the creation of a 100 billion dollar “Green Climate Fund” for developing nations, if and how this fund will actually be created still remains unclear. As the looming threat of climate change and environmental disturbances becomes more and more immediate, so does the need for policy to combat the issue. As a relatively new phenomenon, climate change has yet to receive the political attention it deserves. However, the climate justice and climate change movements are gaining momentum on an international scale as both grass roots campaigns and supranational organizations begin to gain influence. However, the most significant and impacting changes come from national and state governments around the world, as they have the political and monetary power to more effectively enforce their proposals. As it stands today, there is no country-wide legislation with regards to the topic of climate resiliency in the United States. However, in mid February 2014, President Barack Obama announced his plan to propose a $1 billion “Climate Resilience Fund”. The details of exactly what the fund will seek to accomplish are vague since the fund is only in the stage of being proposed for Congress’s approval in 2015. However, in the speech given the day of the announcement of this proposal, Obama claimed he will request “...new funding for new technologies to help communities prepare for a changing climate, set up incentives to build smarter, more resilient infrastructure. And finally, my administration will work with tech innovators and launch new challenges under our Climate Data Initiative, focused initially on rising sea levels and their impact on the coasts, but ultimately focused on how all these changes in weather patterns are going to have an impact up and down the United States - not just on the coast but inland as well - and how do we start preparing for that.” Obama’s fund incorporates facets of both urban resiliency and human resiliency theories, by necessarily improving communal infrastructure and by focusing on societal preparation to decrease the country’s vulnerability to the impacts of climate change. Phoenix’s large population and extremely dry climate make the city particularly vulnerable to the threats of drought and extreme heat. However, the city has recently incorporated climate change into current (and future) water management and urban design. And by doing so, Phoenix has taken steps to ensure sustainable water supplies and to protect populations that are vulnerable to extreme heat, largely through improving the sustainability and efficiency of communal infrastructure. For example, Phoenix uses renewable surface water supplies and reserves groundwater for use during the instance when extended droughts arise. The city is also creating a task force to redesign the downtown core to minimize the way buildings trap heat and increase local temperatures. The outdated infrastructure pictured here in the Phoenix downtown will be undergoing drastic changes geared towards improvements in efficiency. The city of Denver has made recent strides to combat the threat of extreme wildfires and precipitation events. In the year 1996, a fire burned nearly 12,000 acres around Buffalo Creek, which serves as the main source of the city’s water supply. Two months following this devastating wildfire, heavy thunderstorms caused flash floods in the burned area, having the effect of washing sediment into the city’s reservoir. In fact, this event washed more sediment into the reservoir than had accumulated in the 13 years prior. Water treatment costs were estimated to be $20 million over the next decade following the event. Denver needed a plan to make sure that the city would not be devastated by future wildfire and flash flood events. DenverWater and the U.S. Forest Service Rocky Mountain Region are working together to restore more than 40,000 acres of National Forests lands through processes like reforestation, erosion control, and the decommissioning of roads. Further, Denver has installed sensors in the reservoirs in order to monitor the quality of the water and quantity of debris or sediment. These accomplishments will have the effect of building a more resilient Denver, Colorado towards the impending increase of extreme weather events such as wildfire and flooding. 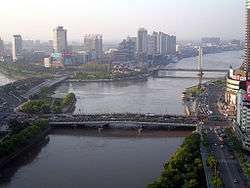 Pictured here is the conversion of three large rivers in Ningbo, China. The country is taking substantial measures to combat the flash floods predicted to intensify in the future. China has been rapidly emerging as a new superpower, rivaling the United States. As the most populated country in the world, and one of the leaders of the global economy, China’s response to the impending effects of climate change is of great concern for the entire world. A number of significant changes are expected to affect China as the looming threat of climate change becomes more and more imminent. Here’s just one example; China has experienced a seven-fold increase in the frequency of floods since the 1950s, rising every decade. The frequency of extreme rainfall has increased and is predicted to continue to increase in the western and southern parts of China. The country is currently undertaking efforts to reduce the threat of these floods (which have the potential effect of completely destroying vulnerable communities), largely focusing on improving the infrastructure responsible for tracking and maintaining adequate water levels. That being said, the country is promoting the extension of technologies for water allocation and water-saving mechanisms. In the country’s National Climate Change Policy Program, one of the goals specifically set out is to enhance the ability to bear the impacts of climate change, as well as to raise the public awareness on climate change. China’s National Climate Change Policy states that it will integrate climate change policies into the national development strategy. In China, this national policy comes in the form of its "Five Year Plans for Economic and Social Development". China’s Five Year Plans serve as the strategic road maps for the country’s development. The goals spelled out in the Five Year Plans are mandatory as government officials are held responsible for meeting the targets. As the world’s second most populous country, India is taking action on a number of fronts in order to address poverty, natural resource management, as well as preparing for the inevitable effects of climate change. India has made significant strides in the energy sector and the country is now a global leader in renewable energy. In 2011 India achieved a record $10.3 billion (USD) in clean energy investments, which the country is now using to fund solar, wind, and hydropower projects around the country. In 2008, India published its National Action Plan on Climate Change (NAPCC), which contains several goals for the country. These goals include but are not limited to: covering one third of the country with forests and trees, increasing renewable energy supply to 6% of total energy mix by 2022, and the further maintenance of disaster management. All of the actions work to improve the resiliency of the country as a whole, and this proves to be important because India has an economy closely tied to its natural resource base and climate-sensitive sectors such as agriculture, water, and forestry. 1 2 3 4 Folke, C (2006). "Resilience: The emergence of a perspective for social-ecological systems analyses". Global Environmental Change. 16: 253–267. doi:10.1016/j.gloenvcha.2006.04.002. 1 2 3 4 Nelson, Donald R.; Adger, W. Neil; Brown, Katrina (2007). "Adaptation to Environmental Change: Contributions of a Resilience Framework" (PDF). Annual Review of Environment and Resources. 32: 395–419. doi:10.1146/annurev.energy.32.051807.090348. ↑ Sharifi, Ayyoob; Yamagata, Yoshiki (July 2016). "Principles and criteria for assessing urban energy resilience: A literature review". Renewable and Sustainable Energy Reviews. 60: 1654–1677. doi:10.1016/j.rser.2016.03.028. ↑ Sharifi, Ayyoob (October 2016). "A critical review of selected tools for assessing community resilience". Ecological Indicators. 69: 629–647. doi:10.1016/j.ecolind.2016.05.023. ↑ Smit, Barry, and Johanna Wandel. "Adaptation, adaptive capacity and vulnerability." Global environmental change 16.3 (2006): 282-292. ↑ Holling, CS. "Resilience and Stability of Ecological Systems". Annual Review of Ecology and Systematics. 4: 1–23. doi:10.1146/annurev.es.04.110173.000245. ↑ Vayda, Andrew P.; McCay, Bonnie J. (1975). "NEW DIRECTIONS IN ECOLOGY AND ECOLOGICAL ANTHROPOLOGY". Annu. Rev. Anthropol. 4: 293–306. doi:10.1146/annurev.an.04.100175.001453. ↑ Tschakert, P, and K A Dietrich. 2010. “Anticipatory Learning for Climate Change Adaptation and Resilience.” Ecology and Society 15: 11. G:\PublicationsDownload\Resilience\tschakert. ↑ J.J. McCarthy, O.F. Canziani, N.A. Leary, D.J. Dokken, K.S. White (Eds. ), Climate Change 2001: Impacts, Adaptation and Vulnerability, Cambridge University Press, Cambridge. ↑ Kasperson, Roger E., and Jeanne X. Kasperson. Climate change, vulnerability, and social justice. Stockholm: Stockholm Environment Institute, 2001. ↑ Barrett, Sam. "Local Level Climate Justice? Adaptation Finance and Vulnerability Reduction." Global Environmental Change 23.6 (2013): 1819-29. Web. 1 2 3 Mathur, Vivek N., et al. "Experiences of Host Communities with Carbon Market Projects: Towards Multi-Level Climate Justice." Climate Policy 14.1 (2014): 42-62. Web. ↑ Towers, G (2000). "Applying the political geography of scale: Grassroots strategies and environmental justice". Professional Geographer. 52: 23–36. doi:10.1111/0033-0124.00202. ↑ Friend, R.; Moench, M. (2013). "What is the purpose of urban climate resilience? Implications for addressing poverty and vulnerability". Urban Climate. 6: 98–113. doi:10.1016/j.uclim.2013.09.002. ↑ Cutter, Susan L.; Emrich, Christopher T.; Mitchell, Jerry T.; Boruff, Bryan J.; Gall, Melanie; Schmidtlein, Mathew C.; Burton, Christopher G.; Melton, Ginni (2006). "The Long Road Home: Race, Class, and Recovery from Hurricane Katrina". Environment: Science and Policy for Sustainable Development. 48 (2): 8–20. doi:10.3200/ENVT.48.2.8-20. ↑ Shonkoff, Seth B.; et al. (2011). "The climate gap: environmental health and equity implications of climate change and mitigation policies in California—a review of the literature" (PDF). Climatic change. 109 (1): 485–503. 1 2 3 4 5 6 7 8 9 10 11 12 Moench, Marcus. Tyler, Stephen. “A Framework for Urban Climate Resilience.” Climate and Development. 2012 , 4:4. ↑ Coaffee, Jon. “Towards Next-Generation Urban Resilience in Planning Practice: From Securitization to Integrated Place Making.” Planning Practice and Research 28:3. 2013. ↑ O'Hare, Paul; White, Iain; Connelly, Angela (2015-09-01). "Insurance as maladaptation: Resilience and the 'business as usual' paradox". Environment and Planning C: Government and Policy: 0263774X15602022. doi:10.1177/0263774X15602022. ISSN 0263-774X. ↑ Roberts, Timmons (2009), “The International Dimension of Climate Justice and the Need for International Adaptation Funding,” Environmental Justice, 2:4. ↑ Lebel, L.; Anderies, J. M.; Campbell, B.; Folke, C.; Hatfield-Dodds, S.; Hughes, T. P.; Wilson, J. (2006). "Governance and the Capacity to Manage Resilience in Regional Social-Ecological Systems". Ecology and Society. 11 (1): 19. 1 2 3 4 5 6 Keim, Mark (2008). "Building Human Resilience: The Role of Public Health Preparedness and Response As an Adaptation to Climate Change". American Journal of Preventive Medicine. 35: 5. ↑ Woodruff et al. “Climate Change and Human Health: Review of the Evidence.” Australian and New Zealand Journal of Public Health, 30. 2006. ↑ Srinivasan et al. “Creating Healthy Communities, Healthy Homes, Healthy People: Initiating a Research Agenda on the Built Environment and Public Health.” American Journal of Public Health, 93. 2003. ↑ Adger, W. N.; Arnell, N. W.; Tompkins, E. L. (2005). "Successful adaptation to climate change across scales". Global Environmental Change. 15: 77–86. doi:10.1016/j.gloenvcha.2004.12.005. 1 2 3 4 5 6 7 Satterthwaite, D (2013). "The political underpinnings of cities' accumulated resilience to climate change". Environment and Urbanization. 25: 381–391. doi:10.1177/0956247813500902. 1 2 Mertz, Ole, Kirsten Halsnaes, Jørgen E Olesen, and Kjeld Rasmussen. 2009. “Adaptation to Climate Change in Developing Countries.” Environmental management 43: 743–52. ↑ Moser, C., & Stein, A. (2010). Pro-Poor Adaptation to Climate Change in Urban Centers : Case Studies of Vulnerability and Resilience in Kenya and Nicaragua. World Bank. ↑ O’Brien, Karen, Siri Eriksen, Linda Sygna, and Lars Otto Naess. 2006. “Questioning Complacency: Climate Change Impacts, Vulnerability, and Adaptation in Norway.” Ambio 35: 50–56. ↑ Baker, C. Richard (2014). "Breakdowns of Accountability in the Face of Natural Disasters: The Case of Hurricane Katrina". Critical Perspectives on Accounting. 25: 620–632. doi:10.1016/j.cpa.2014.02.005. ↑ Unfccc. 2007. “Climate Change: Impacts, Vulnerabilities and Adaptation in Developing Countries.” United Nations Framework Convention on Climate Change: 68. http://unfccc.int/resource/docs/publications/impacts.pdf. ↑ Prins, Gwyn (2011). "Climate Change: Beyond Kyoto". Nature. 474: 576–77. doi:10.1038/474576a. ↑ Rabe, Barry G (2007). "Beyond Kyoto: Climate Change Policy in Multilevel Governance Systems". Governance. 20: 423–44. doi:10.1111/j.1468-0491.2007.00365.x. ↑ Rajamani, Lavanya (2011). "THE CANCUN CLIMATE AGREEMENTS: READING THE TEXT, SUBTEXT AND TEA LEAVES". International and Comparative Law Quarterly. 60: 499–519. doi:10.1017/s0020589311000078. ↑ Oberthür, Sebastian (2011). "Global Climate Governance after Cancun: Options for EU Leadership". The International Spectator. 46: 5–13. doi:10.1080/03932729.2011.567900. ↑ Chawla, Ambika, “Climate Justice Movements Gather Strength,” WorldWatch, State of the World. 2009. 1 2 Malakoff, David. “Obama to Propose $1 Billion Climate Resilience Fund.” Sciencemag.org. http://news.sciencemag.org/climate/2014/02/obama-propose-1-billion-climate-resilience-fund. 15, February 2014. 1 2 EPA. “Climate Impacts and Adaptation Examples in the Southwest.” http://www.epa.gov/climatechange/impacts-adaptation/southwest-adaptation.html. 1 2 King et al. 2012. "The Response of China, India, and Brazil to Climate Change." Smith School of Enterprise and the Environment. University of Oxford.